Sir Harold talked about his life in journalism and themes from his newest book, Do I Make Myself Clear? 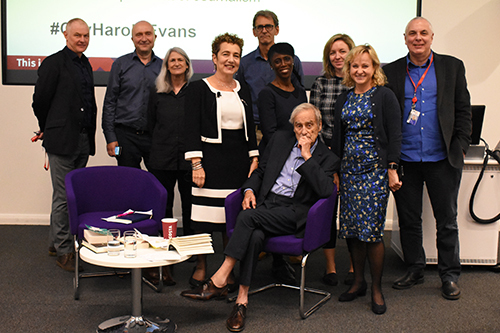 The former Sunday Times editor Sir Harold Evans discussed his wide-ranging career during a talk at City, University of London. At a free public event, Sir Harold gave his views on language, politics and the media, and talked about his newest book, Do I Make Myself Clear? He was interviewed by the Head of Journalism at City, Professor Suzanne Franks, who introduced Sir Harold as “the closest to a legend there is in the world of journalism”. Asked what advice he would give aspiring journalists, Sir Harold said it was vital to “express yourself in clear language” and stressed the importance of being inquisitive. “The most important quality a journalist has is curiosity,” he said. During a Q&A with the audience, he discussed the threat that Donald Trump posed to journalism following the US president’s attacks on the media. Sir Harold – who has lived in the United States for many years – said he thought criticism of the press in the US would “diminish” after Trump left the White House but added the “seeds of distrust” had been sown.